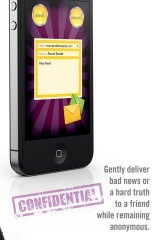 Secret Sender is a unique app that allows you to send an email message to anyone anonymously. Whether you are trying to avoid the ramifications of being “the messenger” of bad news or you want to tell someone you secretly admire them, then this is the app for you. There are no sign-ups or Ads of any kind. You simply input the recipients email, a subject, and a message and press send. I find the concept of this app quite interesting, although I can see how it could be used for nefarious reasons. Please be aware that although the recipient won’t ever know it is you, they have the option of opting out of all future communication from this app in the email you send. It is worth noting that the first message I sent to myself was delivered quickly, but ended up in a Junk folder, so don’t expect the email to be necessarily read right away.